Making my own cleaning products has been an extension of my love for playing with oils, pastes and powders; something I do in the kitchen, in the bathroom –to make beauty products– and now in the laundry room. These are some easy ways to start cleaning thoroughly but gently, and some easy DIY recipes. It is good for the environment, and good for my family’s health and budget. What’s not to love? 1- Let go of the prepackaged wipes and mop liners, use microfiber or cotton rags, a cloth duster and a mop head you can toss in the washer when needed. Leave the disinfectant wipes, I use the more natural kind, for potentially harmful stuff, like cleaning the counter after cutting raw meat. 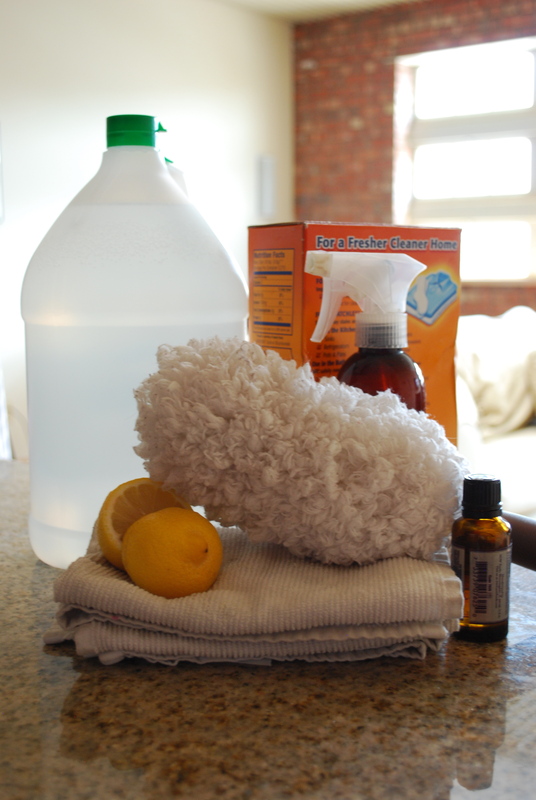 My cleaning essentials include big containers of vinegar and baking soda, as well as lemon and cloth rags. 2- Make your own window spray using 1 part distilled white vinegar, 1 part water and the rinds of a lemon in an old natural spray bottle that has been cleaned thoroughly. Spray on glass and wipe with newspaper or a non-piling cotton rag. This works great on mirrors too. Don’t worry about the vinegar smell, it will evaporate quickly. 3- Mop your floors with vinegar. Same ideas as above. Pour half a cup of vinegar on your mop bucket as you fill it with warm water. If you really want that strong lemony smell, add a couple of drops of lemon essential oil. This works great in tile and wood floors. 4- For a bathroom cleaner that smells, well, clean, without the harsh chemicals, mix baking soda with a few drops of tea tree oil and enough water to make a paste. Use as you would any bathroom cleaner. I store the leftover paste, and add more water if needed before using again. Tee tree oil is natural but it is very strong, always keep away from kids, and don’t pour it directly on your skin, it should always be diluted either with water or a carrier oil (if you are using it for beauty products). 5-Instead of lighting a candle or spraying your room full of VOCs (volatile organic compounds) that could be harmful to breathe, simmer one sliced lemon and a tablespoon of whole cloves. Your home will smell delicious and homey. I have tried making my own laundry detergent, but even though I liked it, I did not think it was worth my time as I have found an inexpensive, efficient and natural one that I really like. I am still on the look out for a good natural recipe to clean around my gas range. Disclaimer: Every since my son was born my house has been significantly less clean than before because when I have a minute to myself I usually prefer to take a nap or read the newspaper. How do you keep your house clean? This is the recipe I use for laundry detergent. It takes me about 30 – 45 minutes to make. My last batch I made 6/14/13 and today (2 months later), I’ve used a little less than 1/4 of it. To me, the cost savings is well worth my time. (All the ingredients cost me under $20) This is a powder detergent so you don’t have to boil the fels-naptha. I grate the fels-naptha with a cheese grater, then process it in my food processor. I mix all the ingredients together is a large trash can sized bin and store them in rubbermaid containers. 1 Box of Super Washing Soda 3 lb. 7 oz. 1 Box of Pure Baking Soda 4 lb. Finely grate the Fels-Naptha. Mix all the ingredients together and store in container of your choice. Use only 1-2 Tablespoons of detergent per load. This looks similar to the recipe I used, although I used castile soap instead of Fels-Naptha and essential oil for scent. From what I hear Fels-Naptha works great at eliminating stains, and is often used as a pre-treatment, but it is also a skin irritant, so I wouldn’t recommend it for people with sensitive skin. Grating the soap with the box grater was what got to me, maybe I’ll try it again now that I don’t have a newborn! Thanks for reading Lemon Water!